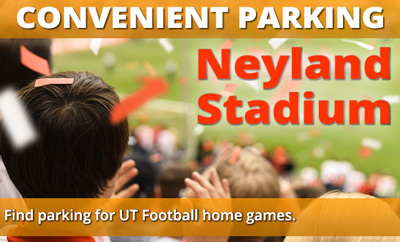 Convenient parking is available for University of Tennessee football home games at Neyland Stadium. Refer to the map for more information on game day parking or to reserve a guaranteed space. Neyland Stadium is home of the UT football team, and the fifth-largest stadium in the nation. Fans pack the stadium each autumn Saturday to watch Big Orange football.